In the field of political behavior, “egocentrism” refers to the idea that the beliefs of individuals about what constitutes good public policy are based largely on their own varied material considerations (e.g. their income and where they work). The field of international/ comparative political economy has built different models of egocentric preferences based on income, industry of employment and, more recently, firm-based characteristics. But recent survey research, focused largely on trade policy preferences, has found little support for egocentrism on any basis. In our American Journal of Political Science article, we reconsider this conclusion with a focus on a different macroeconomic issue: should monetary policy be more focused on domestic or international policy goals? Given the fact that such macroeconomic issues are complex, we argue that individuals should only be able to express egocentric preferences when they have sufficient contextual information. We define “contextual information” as content about the costs and benefits of a particular policy. By itself, contextual information does not directly indicate that a policy is good or bad; instead, it summarizes the relevant policy tradeoffs. Without contextual information, expressed policy preferences on a complicated issue may largely be incoherent. But with sufficient contextual information, egocentrism may emerge. To test this hypothesis, we focus on U.S. monetary policy since it is a complex international macroeconomic issue with relatively low informational content. We sample American monetary policy attitudes using three surveys (two nationally representative) and a survey experiment. Our surveys and experiment ascertain whether contextual information added through survey vignettes can produce egocentric monetary policy preferences. Our results show that an American respondent whose employer does more business in overseas markets has a lesser preference for domestic monetary autonomy (findings in support of firm-based egocentrism). We also find in a survey experiment that the strength of this egocentric relationship depends on the informative power of the vignette: a more contextually informative vignette produces a stronger relationship between the individual’s overseas business activity and his/her preference against domestic monetary autonomy. As one of the most common, persistent, and deadly forms of violence in the international system, civil war has garnered significant attention from scholars and policy-makers alike. Academics have shed significant light on country and conflict-level factors that influence how and when civil wars end, such as combatants’ military strength, the design of settlement agreements, and the presence of natural resources. Policy and media accounts of these conflicts, however, frequently stress the role of individual leaders in the success or failure of settlement processes. Leaders like Joseph Kony of the LRA and Bashar Assad of Syria are frequently attributed personal responsibility for thwarting efforts to end persistent conflict in their respective countries. This raises an important question, one which existing scholarship has yet to answer: do rebel and state leaders influence the trajectory and outcome of civil wars? In an article forthcoming in the American Journal of Political Science, I eschew standard approaches to the study of civil war that focus on country and conflict characteristics, instead examining the influence that rebel and state leaders have on civil war outcomes. By focusing on leaders’ incentives, I am able to account for the fact that leaders, at times, are driven more by a desire to avoid punishment (e.g. loss of power, exile, imprisonment, or death) than by a desire to act in the best interests of their constituents. My research shows that the risk of punishment is particularly high for leaders who bear responsibility for the war – those in power when the war started or who share political or familial connections with the first leader. In fact, responsible leaders are between 65% and 96% more likely to be punished for performing poorly in war than non-responsible leaders (i.e. those not connected to the original decision to fight). How does the high risk of punishment for responsible leaders affect conflict outcomes? Because responsible leaders face an increased risk of punishment should they fail to achieve wartime objectives, these leaders are unlikely to settle for compromise terms, and are more likely to experience an extreme outcome – major victory or total defeat – than their non-responsible counterparts. In fact, my research shows that responsible leaders are 315% more likely to experience extreme outcomes and are 69% less likely to make concessions to end their wars. What does this tell us about the prospects for peaceful settlement of the world’s most persistent civil conflicts? In some ways, the news is not particularly bright: my findings suggest that the prospects for successful negotiated settlement are low when responsible leaders hold power. In fact, settlement efforts may be largely futile under these circumstances, as the very process of negotiation and compromise increases responsible leaders’ vulnerability. On the other hand, my findings do suggest possible strategies for making mediation and settlement attempts more successful. In particular, if negotiators can simultaneously address the political issues at stake and the personal security concerns of responsible leaders, they may be able to overcome high barriers to settlement and achieve lasting peace. Finally, my results ultimately suggest that the ripest moments for conflict resolution occur only once non-responsible leaders take power. Thus, the Colombian peace process with FARC began in 2012, shortly after two non-responsible leaders came to power. Despite fits and starts since then, many commentators view this process as the best opportunity for lasting peace since the conflict began over 50 years ago, and my own research corroborates this view. Only time will tell whether or not such optimism is warranted. Does Compulsory Voting Increase Support for Leftist Policy? The functioning of democracy rests on an ingenious idea: Since politicians seek re-election, they will pursue policies that enhance a country’s overall welfare. A fundamental problem with this idea may be, however, that in reality only a fraction of all citizens vote. Does this lead to policy choices that differ from those politicians would make if almost everybody voted? If so, unequal political participation in a democracy fails to enhance the welfare of its citizens because politicians only provide benefits to those – typically richer and higher educated – individuals that turn out to vote. Because of the potential gravity of this problem, some have argued that countries should introduce compulsory voting. Unfortunately, it has proven difficult to ascertain the causal impact compulsory voting on policy. For one, a simple comparison of election outcomes before and after the introduction of compulsory voting will likely provide misleading results. Too many things other than compulsory voting will have changed simultaneously, for example, the most pressing social and economic problems, international affairs, the candidates running for office, and the policies they advocate. As a consequence, we cannot say whether a change in election results is due to compulsory voting or some of these other developments. There is another important problem. Most of the time, citizens vote for parties and candidates that offer entire policy packages. Therefore, whenever we observe an election, we do not really know whether the eventual result has something to do with a specific policy that a candidate proposed or with other characteristics such as their competence or personality. To circumvent these problems we study federal referendums in a Swiss canton in the first half of the 20th century. Within that period, the canton of Vaud practiced sanctioned compulsory voting for about 20 years. In many other cantons, however, voting remained voluntary at that time. Yet, they voted on the same policy proposals in federal referendums as citizens in Vaud and faced largely similar economic, social, and political contexts. This makes them useful as a comparison group. We find that compulsory voting brings turnout close to 90% in Vaud. This turnout increase doubles electoral support for left policy proposals: Bills that propose stricter market regulation and larger welfare programs. This policy effect of compulsory voting is lower in referendums on core topics, presumably because parties concentrate campaign spending efforts on these frontline issues, which limits the potential mobilization effect compulsory voting can have on referendum outcomes. These findings have several implications. First, and most directly, our evidence suggests that low turnout may indeed lead to policy choices that reflect the views of those who vote, possibly at the expense of those who are politically under-represented. Second, the findings add to a debate in which some worry that compulsory voting mobilizes uninformed voters who will vote almost randomly. This could cause more erratic electoral outcomes and unstable political majorities. At least in the case we examine, sanctioning non-voting leads to a relatively stable increase in electoral support for leftist policies, and only a negligibly small increase in the number of empty ballots. This appears difficult to square with the random voting argument. This article is part of the AJPS Virtual Issue: Most Cited, 2015-16. Electoral participation varies a lot across democracies. While the previous literature has focused exclusively on the electoral system, we show that the institutional mapping from seats in parliament to the power of changing policies matters at least as much. Even when the electoral system is one of the two pure extremes (winner-take-all or PR), other institutions affect the degree of proportionality of power shares. Such institutions include the veto power of a qualified minority, the way margins of victory translate into committee assignments or guarantee a more powerful mandate, the division of powers between the legislature and the executive, federalism, the power to appoint constitutional judges, etc. We show that, for any distribution of voters’ preferences, turnout is highest for intermediate levels of the overall institutional mapping from votes to power. The degree of power sharing which maximizes turnout is closer to even power sharing when electoral competition is lower, and closer to winner-take-all when electoral competitiveness is higher. The intuition is as follows. As we move a away from an even power sharing system, the institutional system becomes more and more similar to a system where power is concentrated in the hands of the party that obtains a plurality of the votes. Hence, turnout drops for any lopsided preference distribution because the underdog side has no chance of obtaining the plurality of the votes, which is all that matters in this case. A system with even power sharing will typically display moderate turnout for all preference distributions, as the incentives to turnout remain even in a very lopsided election: there is always a possible power gain for turning out more. Finally and crucially, for intermediate systems, i.e. between full power sharing and no power sharing, turnout is the highest. It is particularly striking that this theoretical finding holds with all the well known theories of turnout, from instrumental voting to ethical voting and voters’ mobilization. The important message for future empirical researchers is that any prediction on how turnout depends on the proportionality of the whole political system can be tested using the proportionality indices for the electoral rules, as was done so far in the literature, only if the researcher restricts the sample of countries to those with similar mappings from seats to power, for instance countries with similar division of power between the legislature and the executive. Similarly, the role of the degree of power to the legislature must be evaluated only while keeping the electoral rule constant. For example, we find that turnout increases significantly more with competitiveness in FPTP systems with respect to PR systems when keeping important components of the mapping from seats to power constant. The invasion of Afghanistan following the 9/11 attacks set a precedent for how states could respond to transnational terrorism, with several other states initiating their own ‘wars on terror’ in the following decade. Policymakers justified these military actions as necessary to protect their populations from the grave threat of terrorism. However, terrorism is generally responsible for fewer fatalities than traffic accidents and most terrorist organizations do not achieve their objectives. The disproportionate use military force therefore appears puzzling, especially when we further consider that military interventions typically fail to completely disarm terrorist groups. This raises the question: if terrorists remain unlikely to succeed or cause significant damage, why do states commence costly wars with poor prospects of success in an effort to defeat them? This study addresses this question by investigating the interaction between the macro- and micro-levels. We argue that while terrorism appears insignificant at the macro-level, terrorists can exercise greater influence at the micro-level in smaller geographic stretches, such as towns, villages, or provinces. Such influence may enable groups to seize control of these smaller regions and prevent governments from extracting valuable resources from areas under their control. Moreover, if these territories are strategically valuable, the group could weaken the government’s capability by denying it access to critical resources. We therefore argue that the risk that landless terrorists seize territory creates a commitment problem between governments fighting terrorists and their neighbors. This dynamic process can generate two types of ‘wars on terror.’ First, governments may initiate what we describe as ‘preventive wars’ against terrorists within foreign states to preclude the terrorists from consolidating their gains within the government’s own territory. Alternatively, a ‘predatory war’ occurs when the seizure of territory by terrorist groups weaken a government to the point where it becomes an attractive target to its rival states. Rivals may strategically use the specter of terrorism to justify wars by claiming that the government is a weak state that cannot protect its territory from the terrorist threat. We test this argument by examining conflicts in the African state system from 1990-2006. The African states’ revenues during this period primarily come from oil, gold, minerals, and/or rare earths, making control over primary commodities critical to maintaining power and protecting sovereignty. We hypothesize that states are more likely to initiate preventive conflicts when terrorists threaten their resources, but are more likely to opportunistically exploit terrorism in neighboring rival states to engage in territorial expansion. Our analysis demonstrates that African states facing resource losses due to terrorist activity are on average 383% more likely to initiate preventive conflicts against neighboring states. On the other hand, neighboring states are 200% more likely to use the specter of terrorism as a pretext to seize territory from their rivals via military action. From President Obama’s State of the Union address to Patricia Arquette’s acceptance speech at the Oscar’s, the persistent gap in pay between men and women has become a salient issue on the political reform agenda in America. While the failure of Republican members of Congress to stand and issue applause following Obama’s call for an equal-pay law may be a sign of contention among political elites over pay equalization, the majority of American citizens—democrat and republican alike—believe that paying men and women equal pay for equal work is an important issue. Over the past decade we have seen a rapid growth in research in political science on the causes and consequences income inequality. While political scientists have paid considerable attention to the reaction of citizens to general income inequality, less attention has been paid to inequality in earnings between men and women. One interesting feature of reality of the gender pay gap in the U.S. is the striking variation that exists in this type of inequality in local labor markets throughout the country. At the national level, the ratio of median earnings for men and women is roughly 77 cents to the dollar; however, when looking at this ratio across U.S. counties, data from the U.S. Census Bureau reveals that in some locales, such as Glasscock Co., TX and Dagget Co., UT, the average woman earns as little as 19 cents for every dollar earned by a man, while on the other end of the spectrum, there are counties in the U.S., such as Glades Co., FL or Mora Co., NM, where the average woman earns 1.20 or 1.70 for every dollar earned by the average man. This variation is striking, and begs the question of whether the political views of American women are in some way responsive to such variation in gender pay inequality. In my recently published article entitled “Breaking the Glass Ceiling: Local Gender-Based Earnings Inequality and Women’s Belief in the American Dream,” I present a map that displays this variation in gender pay inequality in counties through the U.S., and ask the critical question: Does the level of earnings inequality between men and women in women’s local area influence their level of belief in the American Dream? Utilizing multiple nationally representative surveys conducted by the Pew Research Center, I find that individual American women’s belief in a core tenet of the American Dream—the doctrine that hard work and determination will translate into financial success—is systematically tied to the level of earnings inequality between men and women in their county of residence. This relationship, however, is quite nuanced, and follows a pattern suggested by “rising expectations” theory, which is a brand of relative deprivation theory. Specifically, I find that individual women’s disillusionment with the American Dream is highest when they reside in counties where the average women’s earnings represent three-quarters, or 75 cents to the dollar, of the earnings of men. Thus, rather than disillusionment being highest in counties where women’s earnings lag far behind those of men, it is most pronounced in counties where women’s earnings place them close to, but still an arm’s length behind, those of men. Interestingly, I find that in counties where women’s earnings on average have achieved or surpassed parity with men, individual women’s belief in the American Dream is greatly restored. In other words, in locales where women earn incomes equal to or exceeding men, individual women in these contexts believe the American Dream is alive and well. Why aren’t elected officials more responsive to their constituents’ policy preferences? Most explanations focus on either electoral or legislative institutions. They assume that politicians learn about and evaluate their constituents’ policy preferences in an unbiased manner, but then institutions — such as partisan primaries or influential donors — incentivize politicians to enact policies that counter what their constituents want. In this paper, we propose an alternative explanation for incongruence that stems from psychological biases. Specifically, we test whether politicians discount the preferences of those they disagree with. In other words, do they believe that disagreeing opinions are less legitimate and less informed? We refer to this phenomenon as disagreement discounting. To test whether elected officials are prone to this bias, we conducted experiments on both state legislators and elected municipal officials from across the U.S. through an online survey. In the experiments, actual politicians were asked to evaluate a letter that was ostensibly written by a constituent to their elected official. The content of the letter was randomized so that half of participants read a letter supporting their position on an issue while the other half read one opposing their position. The elected officials who read a letter opposing their position were less likely to believe that the letter writer understood the complexities of the issue or that they strongly held their position. They also thought that the letters expressing an opposing position were more likely to be a form letter from an interest group. Together, these perceptions on the legitimacy of constituents’ opinions incentivize officials to be less responsive to voters when their policy preferences are dissimilar. In the paper, we also show that disagreement discounting is exacerbated by an activity central to representative governance—taking and explaining one’s policy positions to others. Through a survey experiment on U.S. adults, we found that requiring survey respondents to explain their position on an issue made them much more likely to discount opinions that opposed their position. This suggests that an activity that elected officials regularly engage in also has negative repercussions for policymakers’ responsiveness to constituents’ preferences. These findings address a broader question for future work to consider: what other institutions and common political practices exacerbate biases in elected officials’ perceptions and decision-making? Here, we identify one common practice, but others are likely at play. At the same time, other institutions may help reduce biases. Identifying how different institutions affect these biases is important for reformers and policymakers who seek to improve democratic responsiveness. Congressional scholars have long argued that important committee positions allow members of Congress to procure more pork. However, previous studies cover only one or a few committees and generally fail to distinguish the effects of committee membership from selection onto committees. While members of important committees are known to procure more pork, we previously had no way of knowing whether this difference arises because committee positions increase pork or because different kinds of members (from different kinds of constituencies) select onto certain committees. Figure 1 illustrates the point. Here we show the earmarks procured by three groups of senators in the 110th and 111th Congresses. When we look within either Congress, we see that senators on Appropriations brought home more than twice as much earmark money as those not on the committee. However, we should not assume that membership on the committee caused the difference. Committee members may represent high-need constituencies, or the senators who otherwise procure many earmarks may be more likely to join Appropriations. To illustrate the pitfalls of interpreting the cross-sectional differences, we plot earmarks for those senators who did not serve on Appropriations in the 110th but joined the committee for the 111th. Even before these senators joined Appropriations, they were procuring significantly more earmarks and at virtually the same level as members of Appropriations. There is strong selection onto committees but little apparent effect of the committee position. In our paper, we go beyond this simple example and assemble decades of data on federal outlays and congressional committee and subcommittee assignments. To distinguish between selection and the effects of committees, we utilize a within-member design, comparing changes in pork for legislators who join or leave important committee positions to changes in pork for other legislators who do not change committee positions at the same time. In doing so, we account for the fact that members of certain committees may differ from non-members in their abilities, priorities, or the type of constituents they represent. 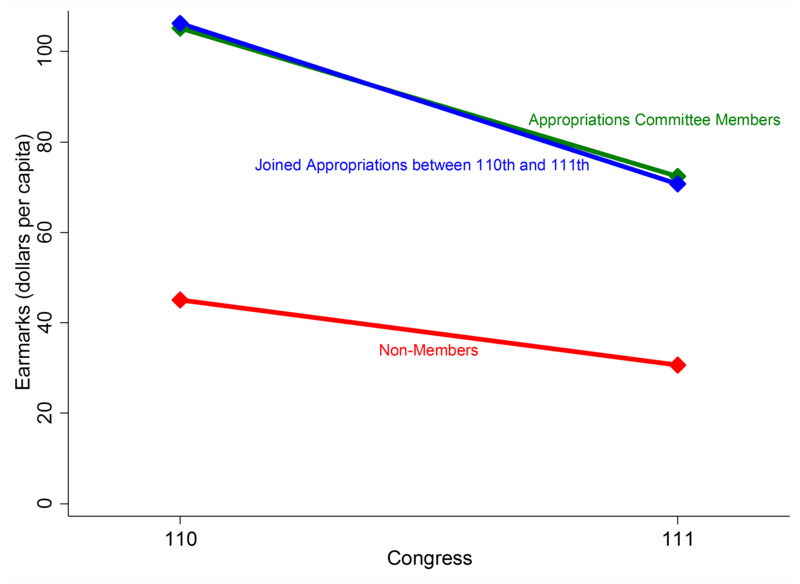 In general, our results confirm the impression from Figure 1: committee positions produce little additional federal funding for an individual legislator. Even a seat on the vaunted Appropriations Committees in the House or Senate produces no detectable change in pork. Moreover, a seat on an authorizing committee or an Appropriations subcommittee produces no additional spending even when focusing on programs within the domain of that committee or subcommittee. The chairs and ranking minority members of the Appropriations subcommittees—the so called “cardinals” of Congress—are exceptions. These positions do generate significantly more funding for constituents but only from programs under their subcommittee’s jurisdiction. Our results paint a new picture of distributive politics and call for a reexamination of canonical theories. The cardinals are perhaps more important than previously thought, but in contrast to expectations, other members are merely clerics whose constituents receive no detectable benefit from their committee positions. Voting begets voting. Not just in the sense that current voters are more likely to vote in the future than current non-voters, but in the sense that voting in one election is itself responsible for raising the probability that an individual will vote in future elections. The size of this effect varies substantially by place, time, and individual voter, but we estimate the average effect to be approximately 10 percentage points. Put another way, consider two identical individuals both of whom have 30% chance of voting in 2012. If one of them were randomly induced to vote in 2008, our estimates suggest she would have 40% chance of voting in 2016. Estimating the impact of voting on voting is difficult because voters and non-voters differ in many ways, most of which is unobservable. In order to understand the effects of voting itself, we need to create or exploit a situation in which individuals are similar except for the fact that some vote and others don’t. We take advantage of two such situations: large-scale Get-Out-The-Vote (GOTV) experiments and the voting-age eligibility cutoff. Both strategies have been used before, but our article applies them to many new circumstances, allowing us to document how much the effect varies across contexts and individuals. 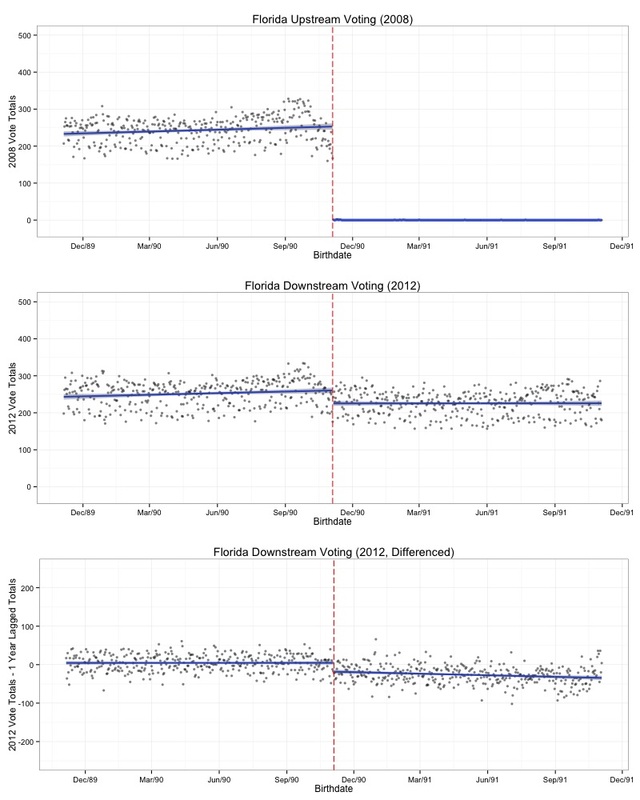 Large-scale GOTV experiments aid the study of voter habit by randomly encouraging some people to vote but not others. For example, in the 2006 social pressure experiment, some voters were sent mailers prior to the August 2006 election that displayed their past vote history and indicated that researchers would be watching to see if they turned out or not (the so-called “Self” mailing). Those in the control group turned out at a rate of 31%, those who got the Self mailing turned out at 36% – the treatment increased turnout by 5 percentage points. 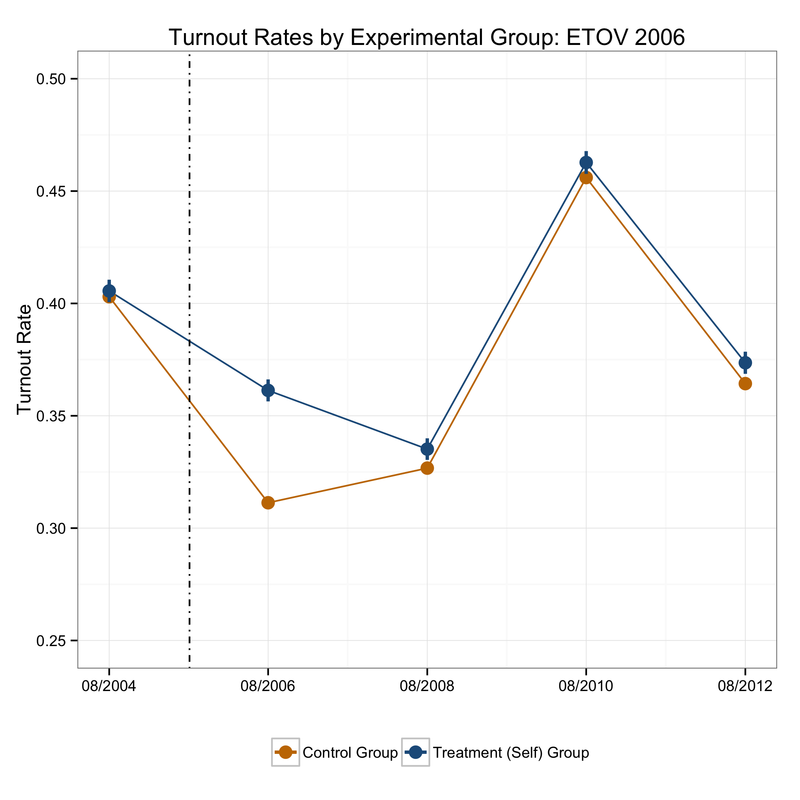 Interestingly, the treatment versus control difference in voting behavior persisted for at least the next 6 years: in every August election between 2006 and 2012, the treatment group voted at a statistically significantly higher rate. The figure below shows how the voting rates of the two randomly formed groups evolved over time. In order to estimate the causal effect of the act of voting itself, we have to invoke an assumption (the exclusion restriction) that states that the reason the treatment group continues to vote at a higher rate was because they were more likely to vote in the 2006 election – and not any features of the initial mailer itself. Under the exclusion restriction, we can estimate the effect of voting on future voting among “compliers” – those who vote if and only if they are encouraged by the mailers to do so. For example, in August 2010, the difference in turnout between the treatment and control groups was a statistically significant 0.8 percentage points. Our estimate of the effect of voting on voting, then, is 0.008 / .05 = 0.16, or an estimated treatment effect of 16 percentage points. This pattern holds not only for this experiment but also for similar experiments conducted in 2007 and 2009. The voting age eligibility cutoff at 18 years of age affords another opportunity for us to study groups that are otherwise similar except for voting. In this setup, those who are “just-eligible” form our “treatment group” and those who are “just-ineligible” our “control group”. Our unit of analysis is the birthdate cohort and our dependent variable is the total number of votes cast by that birthdate cohort. (This choice gets us around the problem that voter files do not include people who aren’t registered to vote.). The graph below has three panels. In the top panel, we plot the raw 2008 vote totals, by birthdate, of those who were born within a year on either side of the 2008 eligibility cutoff. The Florida Secretary of State records approximately 250 votes per birthdate for those just-eligible to vote, and (appropriately) 0 votes per birthdate among the ineligible. The middle panel shows the 2012 vote totals – the estimated difference at the cutoff is approximately 25 votes. There are two interesting features of the raw data that this plot makes clear: first, you can see the separation between weekdays and weekend days: fewer babies are born on the weekend. Second, you can see the seasonality in birth trends: more babies are born in the fall. The bottom panel accounts for both sources of variation by subtracting off the vote totals of those born one year prior. (We were careful to match days of the week, so this lag is not exactly 365 days.) When we account for the one-year lag, a large source of variation disappears – we no longer see either the day-of-the-week pattern or the seasonality trend. The estimate at the cutoff is still approximately 25 votes per birthday cohort. Again under an exclusion restriction, our estimate of the effect of voting on future voting is the ratio of the two estimates: 25/250 = 0.10 or 10 percentage points. We chose to show the Florida estimates here because the estimate for Florida is very close to our average estimate. The 10 percentage point average masks quite a bit of variation in the voter habit effect. In our paper, we document how the effect varies depending on the type of election, the closeness of the election, and the state. It’s also important to reiterate that both the experimental estimates and the eligibility estimates only apply to “compliers,” those who are moved by the initial encouragement to vote. Encouragements to vote (either from GOTV messages or eligibility at 18) have long-enduring consequences: Individuals who get these encouragements continue for many years to vote at higher rates than their otherwise comparable counterparts. This robust empirical pattern suggests that electoral participation can become a habit acquired through the act of voting itself. In his first inaugural address, Abraham Lincoln pledged not to invade the South. In 1916, Woodrow Wilson campaigned on the theme that “he kept us out of war.” Both presidents subsequently violated their public commitments. Conventional wisdom in the field of international relations holds that domestic publics are concerned about their state’s international credibility. Political leaders will therefore suffer “audience costs”—or domestic punishment—for making military threats but then failing to implement them. But what happens if a leader, as in the case of Lincoln and Wilson, promises to stay out of a conflict but then reverses course and decides to intervene militarily? There is a substantial literature on “audience costs” resulting from leaders’ failure to implement their prior military threats, but a neglect of the domestic consequences of leaders’ failure to honor their prior public commitment to stay out of a military conflict. Although researchers continue to debate many things, they agree that the causal mechanism underlying audience costs involves a high value placed by the public on a consistency between their leader’s words and actions. If consistency between words and deeds is important, however, it should operate not only when leaders fail to implement their prior threats to intervene in a conflict, but also when they fail to honor their prior commitments to stay out of a conflict. In this study we examine this neglected implication of audience costs theory. Employing a survey experiment, we examine public responses to a U.S. president’s decision to “back in” to a foreign conflict, and compare those with responses to the much more commonly studied decision of the president to “back down” from a foreign conflict. The first experimental group is told that the president announces that the U.S. will intervene with military force if the attack continues, while the other group is told that the president announces that the United States “would stay out of the conflict.” Each of these groups is then told that the attacking country continues to invade. In the second treatment, participants are told either that the president decides to intervene with force or that s/he decides to remain out of the conflict. A third treatment was given only to groups confronted by inconsistent behavior by the president (i.e., either the “back in” or “back out” scenarios). They were told that the president had introduced new information suggesting that intervention was, or was not, in U.S. interests. We found that subjects punished the president both for backing into military conflicts after publicly saying they would stay out, and for backing out of their prior military threats to intervene. This confirms that domestic audiences place a high value on the consistency between their leader’s words and actions regardless of the type of commitment. We also found, however, that subjects imposed greater costs on a leader for failing to implement a military threat than for failing to honor a public commitment not to intervene militarily. Thus inconsistency costs are greater for backing down than for backing in. This asymmetry in punishment is explained in part by the role of new information provided by the president to justify his/her change in policy. Justification based on new information generated a greater reduction of inconsistency costs for a president who backs out of a military threat than for one who backs into a military conflict. These findings reinforce the importance of the consistency mechanism in audience costs theory by demonstrating that it operates regardless of whether a leader’s initial action is to threaten military intervention or to commit to stay out of a conflict. The observed asymmetry of responses to the two kinds of inconsistency raises a host of questions for future research.